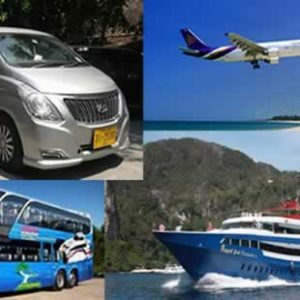 Phuket to Koh Phangan Island – Daily transfers from Phuket Island to Koh Phangan / Full Moon Party via Bus & Lomprayah High Speed Ferry. 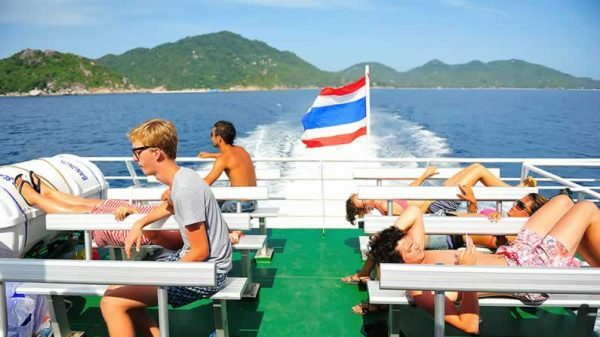 Transfer by Bus & High speed ferry from Phuket Island to Koh Phangan in the Gulf of Thailand, the island famous for the Koh Phangan Full Moon Party. 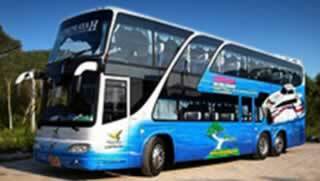 Land Transfers by Air Con Bus from Phuket to Koh Phangan Island. 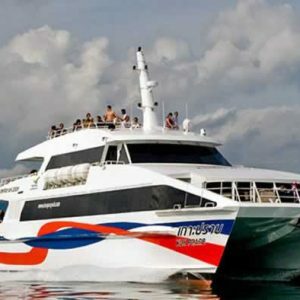 Sea Transfer by High Speed Catamaran to Koh Phangan. 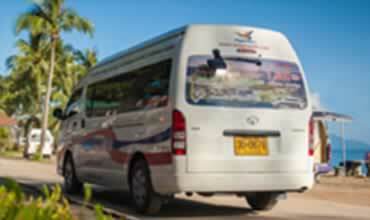 08.00 – Start of Pick up service from your Phuket hotel by Air Con Mini Busses. 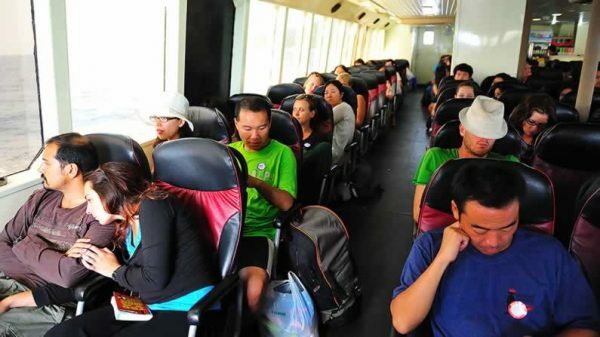 10:00 – Bus departure from Phuket Town. 13:00 – Stop for Lunch at Roadside Restaurant. Food not included. 13:30 – Your Trip continues. 15:00 – Arrival at Tapee Pier in Surathani Town. 15:45 – Boarding the Ferry. If you like to upgrade to First Class Seats go direct to the upper deck and enter the VIP area. Surcharge payable on board in Cash. 16:00 – Ferry departs for Koh Samui Island. 17:15 – Stop over at Nathon Pier at Koh Samui Island. 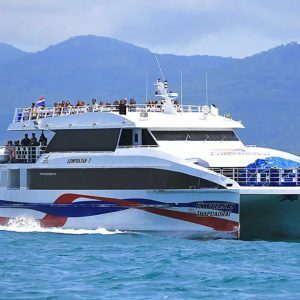 17:30 – Depart from Samui for Phangan. 18:00 – Arrival at Thong Sala Pier on Koh Phangan’s South-West Coast. Please note that above Phuket transfer timing & Itinerary is subject to changes based on weather, sea & road conditions. Pick up service from hotels in Ao Makam, Cape Panwa, Chalong, Rawai, Nai Harn, Kata, Karon, Patong, Phuket Town. Land Transfer from Phuket Island to Tapee Ferry Pier in Surathani, by Air Conditioned Big Bus. 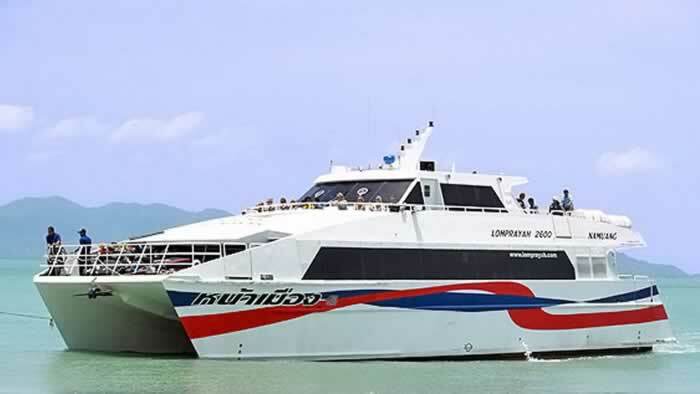 Standard Ferry Ticket on Lomprayah High Speed Catamaran to Koh Phangan Island. 20 kg allowance for luggage per person. Extra weight / luggage will be charged at Phuket Departure Point or at Tapee pier at 20 Thai Baht per kg not exceeding 30kg. Payment can be made only in cash in Thai Baht. Water sports equipment (Such as short boards, long boards, skim boards, knee boards, windsurfing boards etc.) 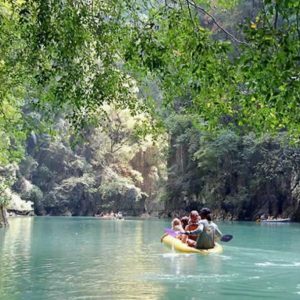 will be subject to a fee of 400 THB for travel by bus and boat or 300 THB for travel by boat only. Bicycles – will be subject to a fee of 700 THB (restricted to folding bicycles only) for transport by bus and boat or 500 THB for transport by boat only. All passengers are advised to travel a minimum of 12 hours before a flight. 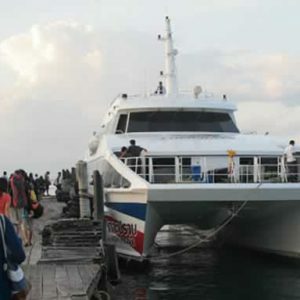 Departure and arrival times can be subject to change due to weather conditions, Lomprayah Ferry SHALL NOT BE HELD RESPONSIBLE for any such delays. E-Voucher need to be presented for this activity. What’s this? Meeting Point / pickup time for your Phuket to Koh Phangan Transfer will be advised in a separate email.